Daja Kisubo and her teacher Frostpine are wintering with friends of his in Kugisko. It is a port location made up of many islands. A strange place for fire mages to holiday. It is here though that a series of strange fires happen. Daja takes it upon herself to assist local firefighter Bennat Ladradun in fighting them. She soon realises that things may not be what they seem when it becomes clear that someone is setting the fires deliberately. Daja decides to use her magic to create something that will hopefully help in fighting the flames. All whilst finding tutors for the two young mages she has discovered. Daja then experiences something terrible, betrayal. Daja’s story is a little different from the others who find themselves with students because she is somewhere where both young mages can find masters, even though she does for a while take over some of their learning. It is in this process she finds out more about herself, and a little about thinking outside the norm, something she should be quiet used to. It is nice to see Daja find someone who treats her more as an equal than a young girl who shouldn’t have the mage qualifications she does. The world Pierce has created is crisp and clear in its descriptions, all the snow and frozen activities, it is all so easy to picture. The complex nature of magic is given plenty of attention here as we see Daja’s skills, as well as cooking magic and carpentry magic bought clearly to life. 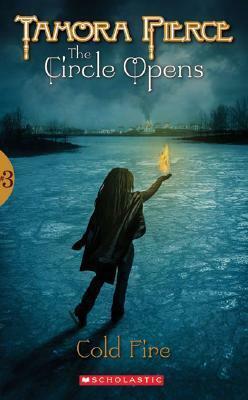 Pierce also uses the juxtaposition of fire and ice effectively in this tale. This is a fitting instalment to the series. It is a pleasure to see each of these characters grow into their own. Once again Piece has excelled and given us a series I will no doubt return to again and again. Tris is visiting the city of Tharios with her mentor Niklaren. This is another opportunity for learning and Tris loves knowledge. There are things happening in Tharios though and when Tris feels the pull of power by a glass mage Keth she is furious until she realises he is untrained and didn’t realise what he was doing. Keth isn’t her only concern though as it appears a killer is out to unbalance the peace and it seems that somehow Keth’s power may be the key to finding this criminal. First though they need to figure out his powers. Tris is feisty, a perfect foil for the reluctant, older Keth. She is headstrong which means his impatience and age are less likely to sway her than if he had a more normal mentor. Tris brings a certain stubornness and determination to the senario. She is out of place in her surroundings and while she tries to adapt she refuses to lose her own identity. Keth’s character is well developed and he comes across so very real, you absolutely feel for his past and the place he finds himself in. The double storyline, teaching and crime, is woven together wonderfully and it makes for a highly entertaining story. The city of Tharios is realised with great detail and texture. The moments of sadness and tension are offset by well placed humour. 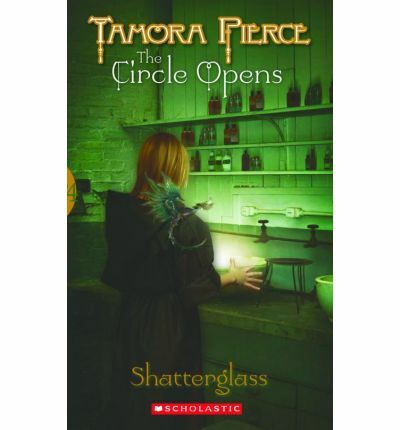 I adore Pierce’s works and read this twice through when I got it, but then if you have read many of my reviews you may already know I love Tamora Pierce’s works. Highly recommended for readers age 10 up. Briar is a plant mage. His is incredibly skilled, especially for one so young. He can distil medicines, get a garden to grow in the blink of an eye and persuade a tree to trap a criminal. He has a very strong empathy with nature and plants love to reach out to him. His is a power that can kill just as easily as it can heal. Briar knows how important it is to learn how to channel your magical ability. While taking a walk through the Golden House Market he stumbles across Evvy. Evvy is a street rat who doesn’t realise she has stone magic, nor is she interested in learning how to control it. In fact she doesn’t want to learn anything from Briar. Briar knows she has to be taught and he tries to find a suitable tutor for her, however Evvy’s life is close to his past and he cannot leave her unprotected. The Circle of Magic quartet are real ensemble stories, with a slight emphasis on one character, in the Circle Opens Quartet the players all get their own stories. Briar’s story is one that masterfully matches the person he has become with the person he was. Evvy is brash and stubborn and no match for Briar who has spent much time with stubborn and powerful female companions. I love the way Pierce has used this story to give insight into Briar’s past. This story is filled with wonderfully visual descriptions of the city of Chammur. Evvy is a fun character who is carefully developed throughout the course of this tale. I look forward to reading more about her. I have to say I loved the climax, it had me unwilling to put my book down no matter what the interruption. Once again a great story from a truly wonderful storyteller. 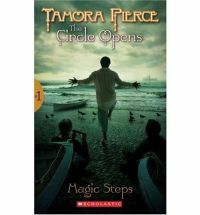 I haven’t come across a Tamora Pierce book I wouldn’t recommend. Sandry can weave magic like it is thread, a unique and awe inspiring skill. For now she has left the Winding Circle and her teacher Lark to look after her uncle, Duke Vedris of Emelan, who has been really ill. Things do not stay as calm as Sandry would like when a mysterious murder is committed in the city. Added to this she finds a young, untrained boy (Pasco) dancing complex magic with no idea of what he is actually doing. 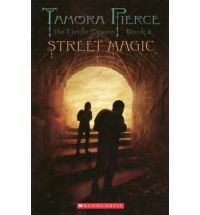 Before she knows it Sandry finds herself charged with teaching Pasco, who isn’t interested in learning magic unless it is something that can be used by the Provost’s Guard, the profession his family are in and expect him to join as well. For them dancing is a waste of time. The murders escalate and it becomes obvious that serious magic is being used in the execution of these crimes and Sandry can’t walk away from what she knows, especially when she knows she can help. She has her work cut out for her; an uncle that won’t slow down even though his health isn’t the best, a reluctant young mage to teach and murderers to catch. Sandry is a determined young woman, not content to sit back and watch. She takes her responsibilities seriously, looks out for others and won’t be pushed aside when people think she should be protected because she is a girl. She is respected because she has earn’t that respect. There are many wonderfully strong and well crafted characters around Sandry. As always Pierce has created a world that lives and breathes, environment and characters woven beautifully together.